Generals fight the last war, and Washington’s economic war on China is straight from America’s tactics against the Soviet Union and its skirmishes with Japan in the 1980s. Yet China is neither the Soviet Union nor Japan. The US’s aggressive trade actions towards Beijing, unless suspended in the near future, will damage the world economy and America itself. The overriding aim of US policymakers is American economic and military primacy. Though China remains far poorer than the US (roughly one-third the gross domestic product per capita at international prices), it has pulled ahead of the US in total GDP when measured at international prices and is converging or ahead on technologies such as 5G. A notable upcoming test will be China’s ability to compete with Boeing and Airbus in the market for civilian aircraft during the 2020s. My own bet is it will be able to compete. In the future, no country will have economic primacy, neither the US nor China. China’s economy will be bigger than America’s by dint of a larger population, yet China will be no hegemon. According to the UN’s medium forecast, China’s population will decline by around 400m between now and 2100. Its population is currently 18 per cent of the world’s and 4.3 times that of America. In the UN forecast, China’s share of the world population in 2100 will be 9 per cent, and just 2.3 times that of America. By 2050, China’s median age will soar to 48 years, more senior citizen than world conqueror. In short, the US policymakers’ China neurosis is vastly overblown. Moreover, the instruments of America’s economic warfare vis-à-vis China are old-fashioned and unlikely to succeed, though they are potent enough to cause damage to both countries and collateral damage as well. The US’s core tactic is cold war-style “containment”, pushing its security alliance (Nato plus Japan, Australia, and others) to stop buying China’s high-tech products or selling it advanced technologies. The word has gone forth to stop buying Chinese telecoms equipment — not because of proven backdoors to China but because such backdoors might exist (or perhaps because the US government would have a harder time spying on its own citizens with Chinese equipment). Across the US security alliance, governments are now blocking China’s acquisition of technology firms. Recently, Washington even floated the notion that China might somehow spy on Americans with Chinese-built subway cars. In the 1980s, as part of its attempt to halt Japan’s manufacturing ascendancy, the US sought to close its markets to exports through quotas and tariffs, while threatening a charge of “currency manipulation” if the yen were to depreciate. From the mid-1980s through the 1990s, the US succeeded in pushing the yen into a sustained overvaluation with threats of the dire trade consequences were Japan to let its currency weaken. The US is playing the same cards with China: close the markets and mutter about currency manipulation. Since US president Donald Trump took office, the renminbi has appreciated slightly against the dollar despite the trade measures, an indication of Beijing’s reluctance to allow the currency to weaken. There are, of course, hawks and doves in the US’s trade war. Hawks want to bring China to its knees, to make it a Soviet Union redux. Moderates, meanwhile, are after specific concessions, for example on intellectual property. China will probably grant these, but they will neither stop Chinese growth nor greatly benefit the US. Mr Trump himself is likely to settle for spectacle, a “great deal” (perhaps “the greatest ever”) with little content, in the hope for adulation from his base. Some apparently believe that a successful deal will return millions of industrial jobs to the US. American manufacturing employment today stands at 12.8m (in a workforce of some 163m), far below the peak of 19.6m in November 1979. Automation, not China, accounts for most of the job losses. Future American jobs will be overwhelmingly in services, not on the assembly line, where robots will do the work. Today’s trade brinkmanship has rising global costs. The world economy is gradually being dislocated by Mr Trump’s impetuousness. Business investments are increasingly stymied by uncertainty. The US president may do the remarkable disservice of turning synchronised global growth in 2018 into a synchronised slowdown this year and next. The renminbi will depreciate significantly if China is pushed too hard, causing further dislocations. Indeed, two months is not nearly enough time for China to make major progress on everything Washington wants (even if Beijing were willing), much less to prove to an exceedingly skeptical U.S. that this time the changes will stick. There’s a growing sense of urgency in each capital to exact concessions from the other, and soon, because both economies are showing more signs of cooling. Neither wants tariffs weighing on its economy when the winter comes, or market panic hastening its arrival. And neither wants to be negotiating with an increasingly weak hand. But there is also a growing sense on both sides that long-term competition is unavoidable. A temporary truce does not preclude a larger conflict, nor will it halt the broader process of economic uncoupling already underway. Think of the trade war like a title fight. The outcome boils down to three main factors: who can punch the hardest, who can take the most hits, and who has the most at stake. China is at a disadvantage in the first two; the U.S. economy depends far less on China than the other way around, and its economic and political systems are more resilient. (The pain felt by U.S. households notwithstanding, the United States absorbs downturns without much damage to its long-term economic trajectory, its national security or its democracy. Not so for communist China, where a sharp downturn is an existential threat.) On the third point, however, China may have an edge. Beijing has little choice but to, if not win its bout with the U.S., then at least stay on its feet until Washington has tired itself out. It wants to demonstrate that tariffs won’t get the United States everything it wants and that, consequently, the measures will become self-defeating. This is because China’s state-led industrial and technology policies and tightly controlled market – the main points of contention for the United States – are critical to the Communist Party’s power, its fight against internal economic dysfunction and its strategic ambitions. For the U.S., meanwhile, its comparative strengths make total victory less essential. It has ample long-term economic and strategic reasons to bring China to heel, and China’s current mounting economic woes give it cause to press the advantage. But Washington could stand down in the fight and still maintain its position of strength. The U.S., moreover, has less costly and potentially more effective alternatives (such as restrictions on Chinese investments in U.S. tech) for curbing some Chinese threats to U.S. interests, regardless of what happens to the tariffs. The U.S. can afford to put China on the back burner in favor of more pressing political and economic concerns. So while the strategic competition between the U.S. and China isn’t going away, conditions are ripening for a deal, if only a symbolic one. Whether this comes to pass, and how meaningful it would be, will depend in part on just how much the trade war contributes to their problems. Let’s take a look at where things stand. That the U.S. has more leeway than China in their trade fight doesn’t mean it’s invulnerable. Washington’s tariffs, for example, will hurt U.S. businesses and consumers in a couple of ways. For one, U.S. firms with manufacturing operations in China will have to pay the fees. The income from U.S. investments in China totaled about $9.8 billion in 2015, or about 0.5 percent of corporate profits in the U.S., according to the Commerce Department. A study by the Peterson Institute for International Economics found that China-based affiliates of multinational firms, and not Chinese-owned companies, produce the bulk of the Chinese exports covered in the first two rounds of U.S. tariffs. It’s hard to get a comprehensive picture of just how much U.S. firms in China are hurting; exports by foreign-invested firms in China (including wholly foreign-owned companies and joint ventures) grew more than 8 percent from September through November 2018 over the previous three months. But according to survey data released by the American Chamber of Commerce in late October, more than half of U.S. companies with operations in China are considering moving at least some of their manufacturing operations to avoid the tariffs. The process could take years for firms without existing operations elsewhere. U.S. tariffs will also hurt consumers and businesses in the United States by increasing the costs of imports. 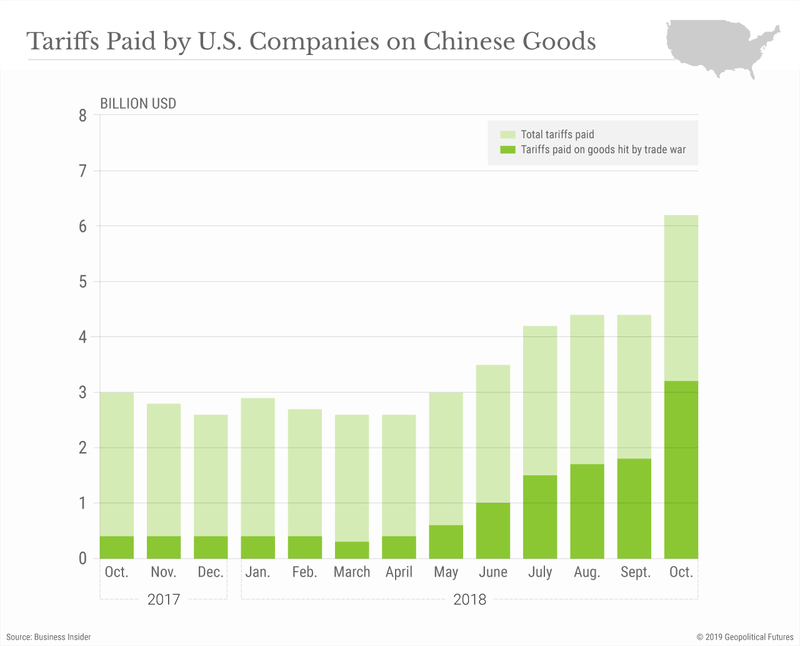 U.S. firms, for example, paid around $2 billion more in tariffs in October 2018 than they did in 2017 – though this includes the taxes on steel and aluminum, which are directed as much at the EU, Japan and Canada as they are at China. For all the damage they’ve done to labor-intensive manufacturing in the U.S., cheap Chinese imports have helped keep a lid on inflation and ease the sting of wage stagnation in the United States. Trade with China, in fact, saved the average U.S. household around $850 in 2015, according to the U.S.-China Business Council. It will take some time for an accurate picture to come into focus here as supply chains reroute and elasticities determine how much of the tariff costs consumers will bear, and how much producers will shoulder. Non-tariff retaliation from China is another potential problem for the U.S. Because it imports less from the United States than it exports there, China can’t match U.S. tariffs dollar for dollar. It can, however, try to make life miserable for U.S. firms in China in other ways. The American Chamber of Commerce survey showed that in September more than half of U.S. firms in China reported an increase in retaliatory measures such as greater regulatory scrutiny, slower customs clearance times and consumer boycotts. It’s a tactic Beijing will have to use judiciously, lest it spook foreign investors at a time when China is already losing its allure. The U.S. economy is also likely to suffer from a decrease in Chinese investment. Chinese firms have spent more than $9 billion since 2000 on 869 greenfield investments in the U.S., according to the Rhodium Group. And according to the Bureau of Economic Analysis, more than 38,000 Americans are employed by U.S. affiliates of Chinese firms, and Chinese investment supports more than 100,000 jobs and nearly $11 billion in gross domestic product. The tariffs themselves won’t deter Chinese investment – in fact they incentivize it, to an extent, for Chinese firms looking to avoid tariffs and perhaps gain political clout in Washington. But tightened U.S. restrictions on foreign investment certainly will, as could Beijing’s restrictions on capital outflows, not to mention nationalist tensions. In 2017, Chinese investment in U.S. firms went into a free fall, dropping 65.8 percent over the course of the year – and 95 percent compared with 2016 – to $3 billion, according Mergermarket. The U.S., of course, is still awash in capital, and the slowing economy may keep interest rates down. Investment may get slightly more expensive, though, since Chinese investors often outbid their competition to gain access to U.S. technology. Perhaps most important, there’s the potential loss in U.S. exports to China. China is the third-largest market for U.S. exports, and its purchases of U.S. goods have grown by more than 85 percent over the past decade. (By comparison, U.S. exports to all other countries grew by just over 20 percent in that time.) China took in some $130 billion worth of goods and more than $50 billion in services from the United States in 2017, its purchases accounting for about 8.6 percent of total U.S. exports and just under 1 percent of U.S. GDP. By September 2018, it had slapped retaliatory tariffs on $110 billion in U.S. goods. The move drove U.S. exports to China down 9 percent, the equivalent of about $3 billion, in the third quarter of 2018, compared with the previous quarter; in October, goods exports were down $4 billion from the year before. The pain of these measures so far has been confined to a handful of sectors in the U.S. economy, such as agriculture, energy and auto manufacturing. In addition, Beijing’s decision to suspend several of the tariffs following a trade truce with U.S. President Donald Trump in December eased it somewhat. Chinese orders for U.S. agricultural, energy and auto exports have reportedly resumed since China temporarily lowered tariffs on these goods while talks are underway. The U.S. economy isn’t out of the woods yet, though. Should Washington follow through on its threats to escalate the trade war if the negotiations fail, Beijing is liable to reinstate the retaliatory fees. What’s more, Chinese consumers could boycott American goods in response to the spike in bilateral tensions, as Beijing has hinted. Rerouting supply chains and commodity flows could offset the effect of these moves, but only in the long term. In the meantime, China is buying more and more from U.S. competitors. According to Beijing, China’s imports from the EU increased by 11.7 percent in 2018, while its imports from the U.S. grew by just 0.7 percent. The threat of declining Chinese consumer demand – whether because of the trade war or because of China’s myriad economic problems – poses perhaps the biggest threat to U.S. goods. For the U.S., the costs of the trade war must be weighed against the economic benefits, many of which are still up in the air. Tariff collections topped $5 billion in October, according to official figures, but U.S. consumers are bearing much of the burden of the new taxes. A handful of new investments or factory reopenings in the U.S. have been announced, mostly in the steel and aluminum sectors, but so have several closings or relocations aimed at avoiding the tariffs or counter-tariffs. Of the 57 percent of U.S. firms in China considering a relocation, according to the American Chamber of Commerce survey, less than 1 percent said they were mulling a move back to the United States. Most are eyeing low-cost manufacturing hubs in regions such as Southeast Asia, South Asia and Latin America. (Given the cost of relocation and the uncertainty surrounding the trade war’s duration and severity, most firms are biding their time to see how things shake out before they make a decision.) And despite the tariffs’ goal of evening the United States’ trade balance with China, the monthly U.S. trade deficit jumped to $43 billion in October 2018, up from just under $26 billion in March of that year. On the year, according to Chinese figures, the bilateral trade deficit soared 17 percent to the highest levels since 2006. China’s economy, meanwhile, is under mounting pressure from nearly every direction. Consumption is down. Manufacturing is shaky. Industrial profits are declining. Household debt is piling up. Bank balance sheets are precarious. And jittery market sentiment is threatening to make everything worse. Beijing is behaving as if it’s staving off a crisis, rolling out a slew of targeted measures to support small businesses, loosen up lending and spur growth. The trade war is just one more thing for China to worry about. Its main vulnerability in the feud with Washington, of course, is the loss in exports to the U.S., which bought more than $500 billion in goods from China in 2017, the equivalent of 18.6 percent of China’s total goods exports and 3.5 percent of its GDP. Yet Chinese exports, even to the U.S., have remained robust since the trade war began. In October 2018, the first full month in which U.S. tariffs were in place on $250 billion worth of Chinese goods, China exported 7.7 percent more goods compared with the previous year. Newly released figures from December suggest that the trade war is starting to hit home: Chinese exports to the U.S. dropped 3.5 percent year on year and 12.8 percent month on month. At the same time, total Chinese exports fell 4.4 percent year on year and 1.4 percent month on month – the biggest drop since December 2016 – to $221.25 billion. A Renmin University study found that exporters cut demand for new hires in the third quarter of 2018 by 53 percent, compared with a year earlier. U.S. tariffs explain only a small part of this decline, though. China’s exports to other major consumers such as Europe and Australia also slowed in December. Furthermore, retail sales in the U.S. and EU have been declining, a trend that disproportionately affects finished Chinese consumer electronics not subject to U.S. tariffs, including smartphones and televisions. (Other major exporters of consumer electronics like Taiwan, South Korea and Malaysia, have also reported a slowdown, meaning a drop in global demand, and not an increase in U.S. tariffs, is likely the culprit.) Exports of Chinese goods covered by the tariffs, on the other hand, have been buoyed by several factors, including Beijing’s support for affected industries, and the front-loading of U.S. orders to get ahead of the next round of tariffs. 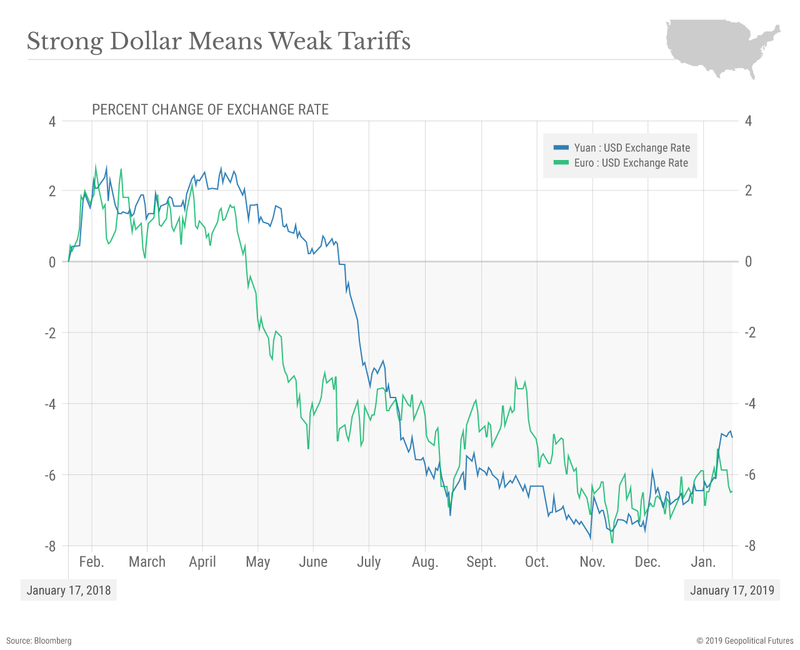 The strength of the dollar, which has jumped 9 percent against the yuan since spring 2018, has been enough on its own to nearly counteract the 10 percent tariffs. Of course, things could get worse for China when the front-loading effect wears off or if Washington raises tariffs from 10 percent to 25 percent in March. And in the longer term, China faces the risk that multinational companies will move their operations to avoid tariffs or that foreign investment dries up. Numerous firms already have announced plans either to close up some of their facilities in China or to open new plants elsewhere, that might otherwise have been in China. That the fallout from these moves will be concentrated in the few coastal provinces that produce most of what China exports to the U.S. – especially Guangdong, Jiangsu, Shanghai and Zhejiang – will magnify the danger. When China has fragmented in the past, it has typically done so along the deep fault lines between the wealthy coasts and the less-developed interior. At this point, though, it’s clear that China is reeling more from the effects of its government’s painful economic reforms than from those of the trade war. The main culprits appear to be the crackdown on “shadow lending,” or off-balance sheet lending, and the new budgetary restrictions on local governments. The initiatives have made local governments reluctant to spend on infrastructure and left banks struggling to lend money to firms, especially to private companies, which had come to depend on shadow lending. The results are a credit crunch and a sizable drop in investment – by far the main driver of growth in China since 2008. Although these are big problems for China, they are largely mechanistic ones that Beijing ostensibly could fix with some structural adjustments and policy changes. There’s enough liquidity to go around, for example; it’s just not going quickly enough to the places that need it most. State-owned enterprises receive the lion’s share of credit, while the private sector, which contributed nearly 48 percent of China’s exports during the first nine months of 2018, is shriveling on the vine. There’s little evidence to suggest any of this is a result of U.S. tariffs. What’s more, these are the kinds of issues Beijing expected to arise when it launched the reforms. The central government knew the changes it needed to make to avoid financial cataclysm would be unpleasant. That’s why President Xi Jinping has reinstated a dictatorship and why Beijing has been clamping down on any potential sources of unrest. It’s why Xi has gradually been preparing the public for a slowdown – for instance by emphasizing “high-quality growth” over breakneck expansion – and letting provincial officials set more realistic growth targets. It’s why Beijing is doing everything it can to keep from rolling back its reforms and unleashing economic stimulus that would only inflame many of the problems. And it’s why Beijing is clinging to its state-led economic model in defiance of U.S. demands. To be sure, the intensity of fallout from these reforms may have caught Beijing off guard. It probably wasn’t expecting to be fighting the U.S. on trade at the same time, either. Things will get worse for China if and when the U.S. and Europe slip back into recession, and the tariffs may very well limit what little room Beijing has left to maneuver – especially if Trump makes good on his threat to more than double the 10 percent tariffs. It’s impossible to say just what Beijing’s breaking point would be, just how much growth has to slow before social unrest puts the political system in jeopardy. But the estimated 0.2-0.6 percent hit to GDP that most expect from the U.S. tariffs is unlikely to push it there. There are bigger monsters keeping Chinese leaders up at night. Which, of course, brings us back to where we began, and to our 2019 predictions for the U.S.-China relationship. China is the weaker party in this dispute, and it stands to lose more than the U.S. Indeed, no less than the future of China, as a strong and independent nation, and the future of the Communist Party of China as its steward, is on the line. China is seeking a short-term accommodation with the U.S. so it can focus on domestic economic irrationalities. Economic and domestic political conditions in the U.S. are pushing Washington in the same direction. But don’t think for a second that whatever arrangement the U.S. and China agree to means that the trade issue has been resolved, or that the broader U.S.-China relationship has stabilized. A deal may be nigh, but the trade war will continue. •The only form of stock market leverage that is reported monthly is "margin debt" - the amount individual and institutional investors borrow from their brokers against their portfolios. •Stock market leverage is the big accelerator on the way up, when people and institutions borrow money to buy stocks. And it's the big accelerator on the way down when margin calls and other financial pressures turn these investors into forced sellers. 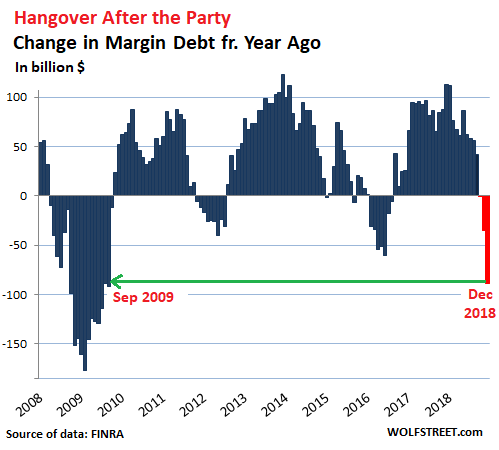 •The plunge in margin debt in the third quarter took a chunk of margin debt off the table, but unwinding such a huge pile of stock market leverage takes time, usually years, with many sharp interruptions in the opposite direction. 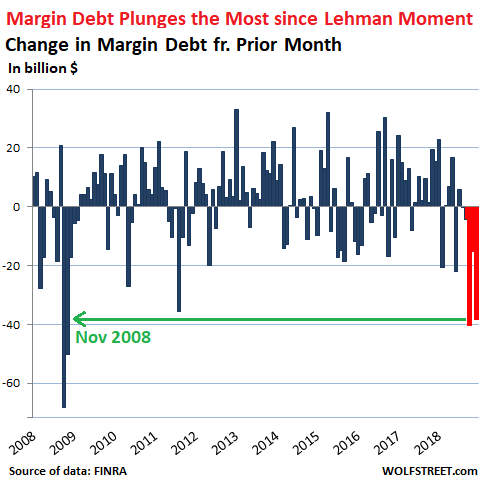 During the ugly stock market December, whose ugliness bottomed out on Christmas Eve, a nasty November, and the ugliest October anyone can remember, margin debt plunged by a combined $93.8 billion, the most since Q4 2008, after Lehman Brothers filed for bankruptcy. The only form of stock market leverage that is reported monthly is "margin debt" - the amount individual and institutional investors borrow from their brokers against their portfolios. But no one knows the amount of total stock market leverage from all forms of leverage, but we know it's a lot higher than margin debt by itself. Stock market leverage takes many forms. It includes "securities-based loans" (SBLs) that brokers extend to their clients, and that some of them report annually, though they don't have to. And occasionally, we get a tidbit about an individual fiasco such as when a $1.6 billion SBL to just one guy blows up. And there are other ways to use leverage to fund stock holdings, including loans at the institutional level, loans by companies to their executives to buy the company's shares, etc. But reported margin debt gives us a feel for which direction overall stock market leverage is going. Stock market leverage is the big accelerator on the way up, when people and institutions borrow money to buy stocks. And it's the big accelerator on the way down when margin calls and other financial pressures turn these investors into forced sellers. The money from the proceeds of those stock sales doesn't then sit on the sidelines or go into other stock purchases; no, it is used to pay down that debt. And these much-hated and feared margin calls apparently have kicked off in Q4. 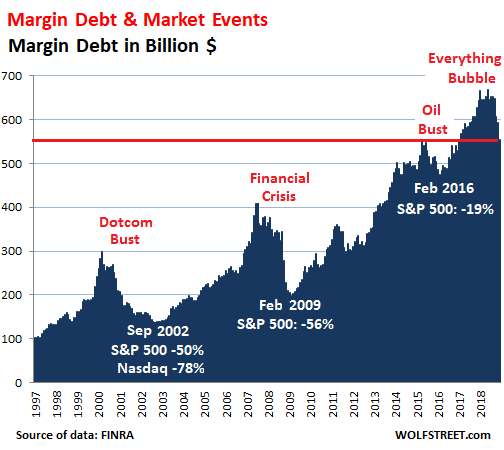 During the blistering stock market boom in recent years - part of the "Everything Bubble," so called since nearly all asset classes inflated in unison - margin debt ballooned to $669 billion at the peak in May 2018, up 60% from the pre-Financial Crisis peak in July 2007, and up 117% since January 2012. Since the peak in May, margin debt has plunged by $114.6 billion. As you can see in the charts above, my dictum, repeated on December 22 - "Nothing goes to hell in a straight line" - holds from a historical point of view as well. Plunges are followed by jumps. This creates a lot of noise. But added together over time, they form a trend. The rally since December 26 tells me that people are piling back into margin debt, and that when we get the January data, margin debt levels will have increased. It is this mechanism that links margin debt and the stock market - but neither is a good predictor for the other because one might occur before the other or simultaneous with the other. But they do move in the same direction over time. The plunge in margin debt in the third quarter took a chunk of margin debt off the table, but unwinding such a huge pile of stock market leverage takes time, usually years, with many sharp interruptions in the opposite direction.